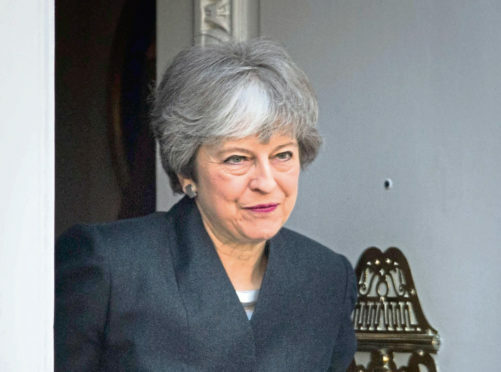 Prime Minister Theresa May leaves Brussels to return to the UK after the European Council in Brussels agreed to a second extension to the Brexit process. The Scottish Government is continuing to plan for the UK crashing out of the EU without a deal despite the extension of the Brexit deadline. Ministers have said they are still having to prepare for a potential no-deal at a future date even though an immediate “full scale” response is no longer required. So far around £100 million has been allocated to Scotland in Brexit funding from Westminster to date, with £44 million already spent. Critics said the money ploughed into preparations for a no-deal Brexit could have been better spent on public services. An army of Westminster civil servants who had been preparing for a no-deal Brexit – at an estimated cost of £1.5 billion – were stood down last week after Theresa May was granted a six month “flextension” until October to get a Brexit deal agreed at Westminster. Yesterday, the Scottish Government said it could not provide a full breakdown of how much has been spent on Brexit preparations so far, including for no-deal. It has been allocated around £44 million in Brexit funding from Westminster to date, with another £54.7 million for this financial year. Danny Phillips, spokesman for trade union Unison Scotland, said: “As a country, we must be prepared for Brexit. “However, we should not be preparing for a no deal and the money that we have spent on preparing for it could have been so much better spent on education, social work, homelessness services and other things the most vulnerable in Scotland need. SNP MSP George Adam said the ongoing uncertainty over Brexit meant preparations must be made for every outcome. He added: “This Brexit shambles has caused grave uncertainty for jobs, business and livelihoods in Scotland – restricting our ability to properly plan for the future. Businesses in Scotland are also believed to have spent hundreds of millions of pounds planning for the possibility of a no deal. Tracy Black, director of business lobby group CBI Scotland, said firms not only had costs associated with direct contingency planning, such as stockpiling and relocation, but with other factors such as lost and delayed investment. She said: “Business investment across the UK has fallen for four consecutive quarters, and eight in ten UK businesses say Brexit uncertainty is negatively affecting investment. Scottish Conservative Chief whip Maurice Golden MSP said the SNP had not spent all the money it had received from the Treasury on Brexit preparations. A spokesman for the Scottish Government: “We continue with our preparations to protect against the threats from Brexit, but no amount of preparation or funding can completely mitigate all the impacts of leaving the European Union.